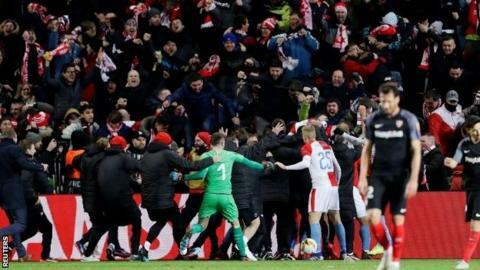 Five-time Europa League winners Sevilla were knocked out by a last-minute Slavia Prague goal in extra time in a dramatic finish to their last-16 tie. The Czech side, who last reached the quarters in 2000, needed two goals in the final 18 minutes to go through. And they found them through Mick van Buren and then Ibrahim Traore in the 119th minute. Simon Kjaer made a mess of clearing Traore's shot on the line as the Czechs won 4-3, 6-5 on aggregate. Their players ran to celebrate with the fans at the Eden Arena as they celebrated their best European run since 1999-2000, when they lost to Leeds in the last eight. Slavia, who drew 2-2 in Spain, had led 1-0 and 2-1 on the night through Michael Ngadeu-Ngadjui and then a Tomas Soucek penalty. But Sevilla battled back both times, with a Wissam Ben Yedder penalty followed by a stunning Munir El Haddadi volley. The La Liga side took the lead through Franco Vazquez - which also gave them the edge on away goals - before Van Buren and Traore turned it around. Match ends, Slavia Prague 4, Sevilla 3. Second Half Extra Time ends, Slavia Prague 4, Sevilla 3. Corner, Slavia Prague. Conceded by Tomás Vaclik. Attempt saved. Ibrahim Benjanim Traore (Slavia Prague) right footed shot from the right side of the box is saved in the centre of the goal. Assisted by Jan Boril. Goal! Slavia Prague 4, Sevilla 3. Ibrahim Benjanim Traore (Slavia Prague) right footed shot from the centre of the box to the bottom left corner. Assisted by Peter Olayinka following a set piece situation. Attempt blocked. Jaromir Zmrhal (Slavia Prague) left footed shot from outside the box is blocked. Offside, Sevilla. Marko Rog tries a through ball, but André Silva is caught offside. Tomas Soucek (Slavia Prague) is shown the yellow card. Tomas Soucek (Slavia Prague) has gone down, but that's a dive. Attempt missed. Tomas Soucek (Slavia Prague) header from the centre of the box misses to the left. Assisted by Mick Van Buren with a cross. Attempt missed. Quincy Promes (Sevilla) right footed shot from outside the box is close, but misses to the left. Assisted by Éver Banega. Second Half Extra Time begins Slavia Prague 3, Sevilla 3. Substitution, Slavia Prague. Michal Frydrych replaces Alex Kral. First Half Extra Time ends, Slavia Prague 3, Sevilla 3. Hand ball by Jan Boril (Slavia Prague). Substitution, Sevilla. Marko Rog replaces Wissam Ben Yedder. Offside, Slavia Prague. Jan Boril tries a through ball, but Ondrej Kudela is caught offside. Corner, Slavia Prague. Conceded by Simon Kjaer. Goal! Slavia Prague 3, Sevilla 3. Mick Van Buren (Slavia Prague) right footed shot from the right side of the box to the bottom left corner. Assisted by Tomas Soucek. Franco Vázquez (Sevilla) is shown the yellow card for excessive celebration. Goal! Slavia Prague 2, Sevilla 3. Franco Vázquez (Sevilla) header from the centre of the box to the top left corner. Assisted by Quincy Promes with a cross. Offside, Sevilla. Éver Banega tries a through ball, but André Silva is caught offside. Attempt blocked. Simon Deli (Slavia Prague) right footed shot from outside the box is blocked. Assisted by Ibrahim Benjanim Traore. Attempt saved. Tomas Soucek (Slavia Prague) right footed shot from very close range is saved in the centre of the goal. Corner, Slavia Prague. Conceded by Maxime Gonalons. Substitution, Slavia Prague. Mick Van Buren replaces Miroslav Stoch.